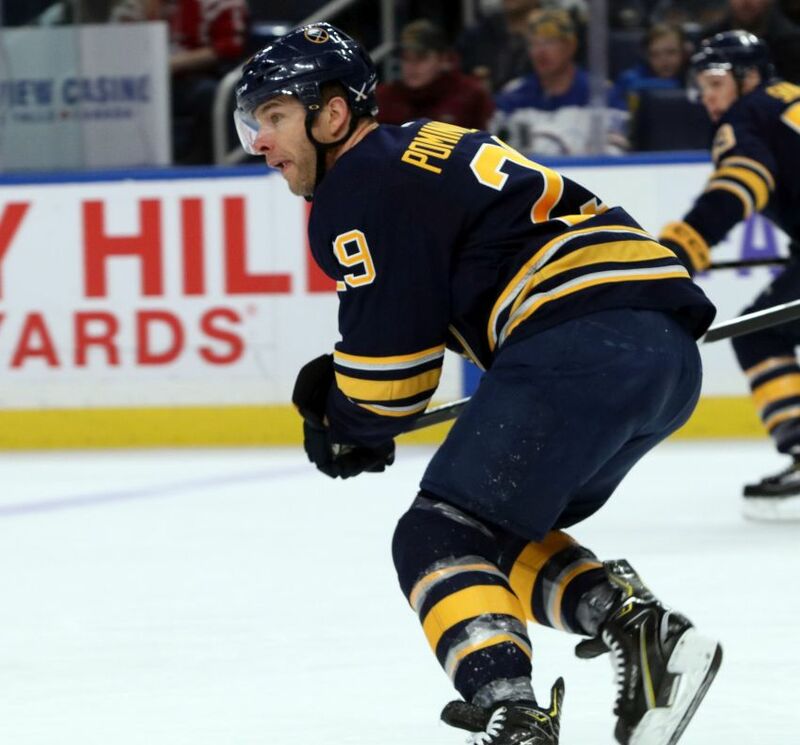 The noise wouldn’t stop after Pominville, 36, was announced as the scorer, so after receiving a signal from his teammates, one of the greatest players in franchise history skated to center ice and acknowledged the standing ovation from the crowd of 17,988 inside KeyBank Center. The fans cheered again as the Sabres on the bench tapped their sticks. In a disastrous season full of more losing and turmoil, Pominville’s goal 12:57 into the third period – it was a simple shot from the right boards that deflected in – provided a rare moment to celebrate. It was his 217th with the Sabres, moving him past Don Luce into sole possession of 10th place on the team’s all-time list. All season long, Pominville has insisted he hasn’t thought much about his future. But Thursday morning, as he drove to the rink before the home finale, he couldn’t help but wonder what it holds. It hit him after 10 seasons with the Sabres, Thursday could be his final appearance wearing Blue and Gold in Buffalo. The thought of his Sabres career ending caused Pominville to break down while chatting with the media prior to the game. “I’ve tried to soak in pretty much everything throughout my career,” Pominville said Thursday morning as he fought back tears. “Since I’ve been drafted – that was in ‘01 – all I’ve wanted to do is wear the sweater. I’ve been fortunate enough to do it for a while. After that, Pominville wiped away some tears. He asked to temporarily end the interview so he could compose himself. Pominville will become an unrestricted free agent following the season. Given the Sabres’ sorry campaign and his advanced age, the chances of him returning might be slim. Sabres coach Phil Housley honored Pominville by putting him in the starting lineup beside top center Jack Eichel and Victor Olofsson. When Pominville’s name was announced, the crowd roared for one of the most popular Sabres in recent memory. Pominville is the last link to the rollicking post-lockout days of 2006 and 2007, when the Sabres ranked among the NHL’s heavyweights. Pominville has showcased terrific longevity. Only one player older than him, Carolina Hurricanes forward Justin Williams, has scored more than his 16 goals this season. He has spent much of the campaign skating beside Eichel. Of course, at times, he has also shown his age. Housley has recently scratched him. He skated on the fourth line Thursday beside center Johan Larsson and Zemgus Girgensons. “(He gives) everything that he has every night, regardless of what ice time he’s getting,” Housley said. “He never complained. He wants to make a difference. He truly believes in this organization, the past and recent present. Pominville, who captained the Sabres for two seasons, has compiled 293 goals and 726 points in 1,059 NHL games. He wore an ‘A’ as an alternate captain Thursday. The former second-round pick ranks eighth in assists (303), points (520) and games (732) in franchise history. What does Pominville want to tell the fans? Housley said winger Alexander Nylander missed Thursday’s game because he suffered a lower-body cut in Tuesday’s 3-2 loss to the Nashville Predators. The Sabres announced the following end-of-season award winners Thursday: Eichel, MVP; defenseman Rasmus Dahlin, Rookie of the Year; goalie Carter Hutton, Unsung Hero; defenseman Zach Bogosian, Man of the Year. With one goal and three points against the Senators, Eichel became the first Sabre to hit the 80-point mark since Pominville and Derek Roy in 2007-08. Olofsson and winger Kyle Okposo both scored power-play goals. Winger Sam Reinhart also scored. Hutton made 21 saves.